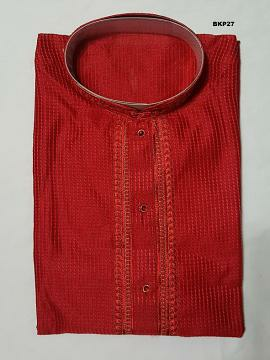 Reddish Cotton Kurtha Pajama S w/ Embroidery for Boys. This 2 pc boys costume comes with a fancy cotton embroidered kurta and traditional style cream color pajama. This item in Kurta Pajama for Kids category was first added to our catalog on 06-08-2017. Buy Reddish Cotton Kurtha Pajama w/ Embroidery for Boys, sold & shipped by Varshini Collections where you can shop online for Kids Ethnic Indian Wear & Ladies Kurtis. This Kurta Pajama collection has been tagged as Kids Wear, Boys Indian Clothes, Party Wear Outfit, Kurta Pajama Dress.